Turmeric's earthy, exotic aroma and flavor make it a delicious addition to many dishes. Turmeric is almost always sold with the dried spices at grocery stores, but some specialty markets carry the fresh root. Swapping fresh root for dried in recipes is possible. Fresh herbs and spices are almost always more desirable than their dried counterparts, and turmeric is no exception. Fresh turmeric is less bitter than dried turmeric. 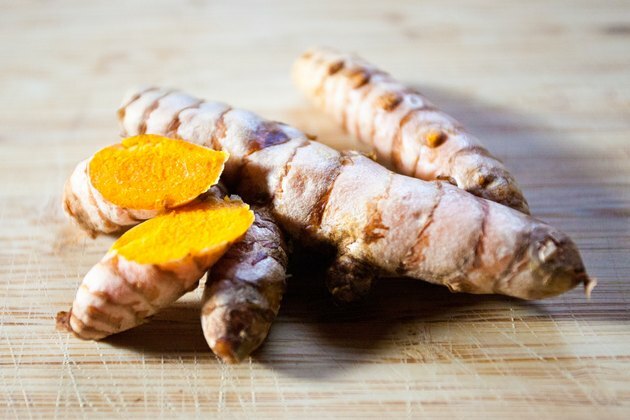 To successfully use fresh turmeric, wash the root of any dirt and scrub it well. You don't need to peel the turmeric, though some people prefer to. 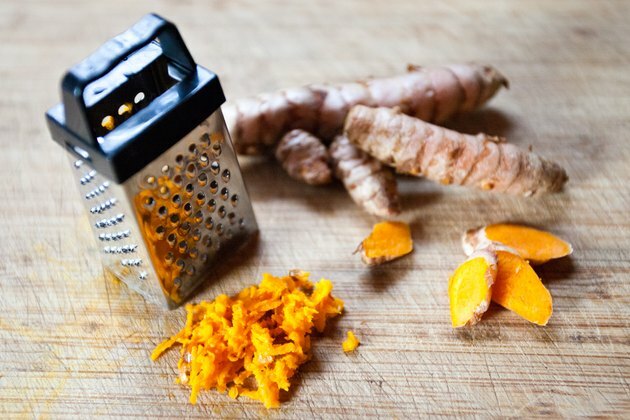 You can grate it with a microplane, ginger grater or the small side of a cheese grater. 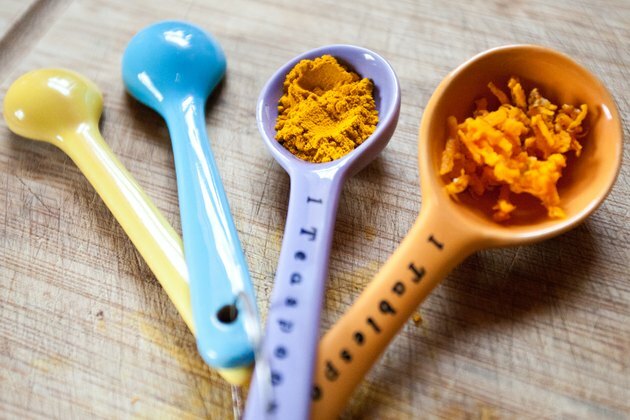 Turmeric can also be smashed with a garlic press or pestle and mortar. The general rule of thumb for converting dried herbs or spices to fresh in a recipe is 1-to-3, so 1 teaspoon of dried spice is equal to 3 teaspoons -- 1 tablespoon -- of fresh. Roughly 2 inches of fresh turmeric root will yield 1 tablespoon of the freshly grated spice. 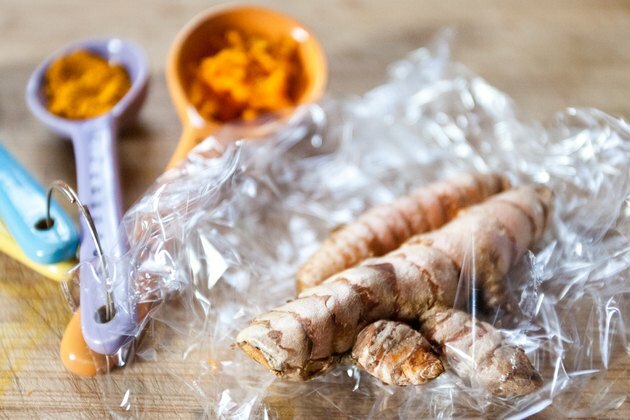 Store fresh turmeric in the fridge, wrapped loosely so it doesn't mold. You can also freeze turmeric. It will be mushy when it thaws out, but fine to add to your dish. Freeze it in usable sizes so you only defrost what you will use at one time. Another method is to peel the rhizomes and pack them in a jar with vodka. Stored in the fridge, these should last for a year or more. Turmeric is bright yellowish-orange and will stain surfaces and fingers, especially in its fresh form. Wear gloves while grating it if you don't want yellow fingertips. 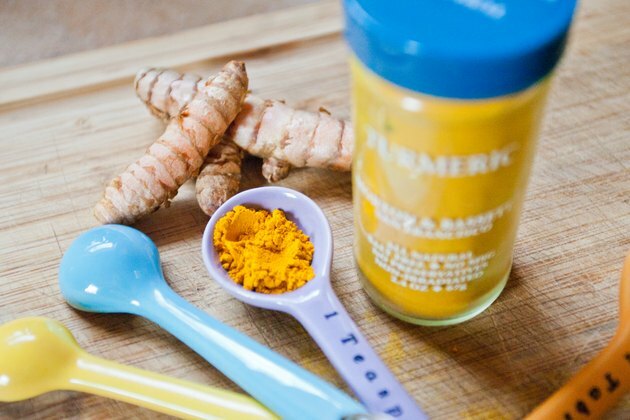 While turmeric in food is considered safe, talk to your doctor before eating large doses or considering taking it as a supplement. It has been touted for its ability to kill cancer cells, among other possible health benefits.